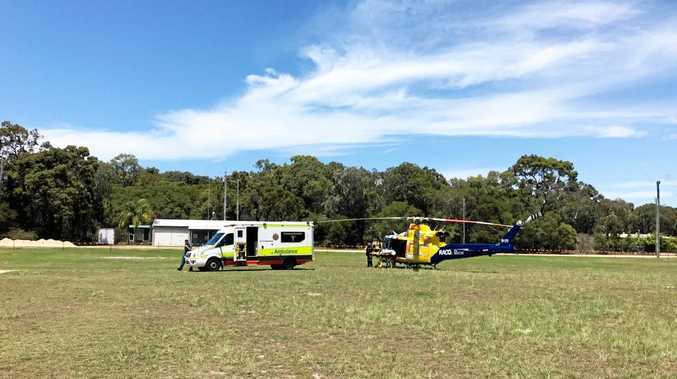 RESCUE: RACQ Capricorn Helicopter Rescue Service airlifted a 59-year-old in a stable condition, suffering with potential spinal injuries from the Agnes Water/1770 area this morning. A MAN was airlifted to hospital after a wave struck his boat this morning. The RACQ Capricorn Helicopter Rescue Service was called in about 10.30am after reports of a boating injury in the Agnes Water area. A spokeswoman said the patient, who was a visitor to the area, suffered the injury when a wave hit the vessel that they were travelling in out near the reef. "The impact from the wave caused the patient to fall against a seat on the boat,” she said.